Dubai Marina Tram Station is one of two stations on the Dubai Tram network that connects to the Dubai Metro. 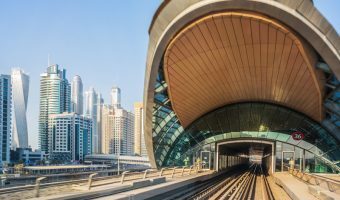 To reach it just cross Sheikh Zayed Road via the walkway to reach DAMAC Properties Metro Station (on the Dubai Metro Red Line). 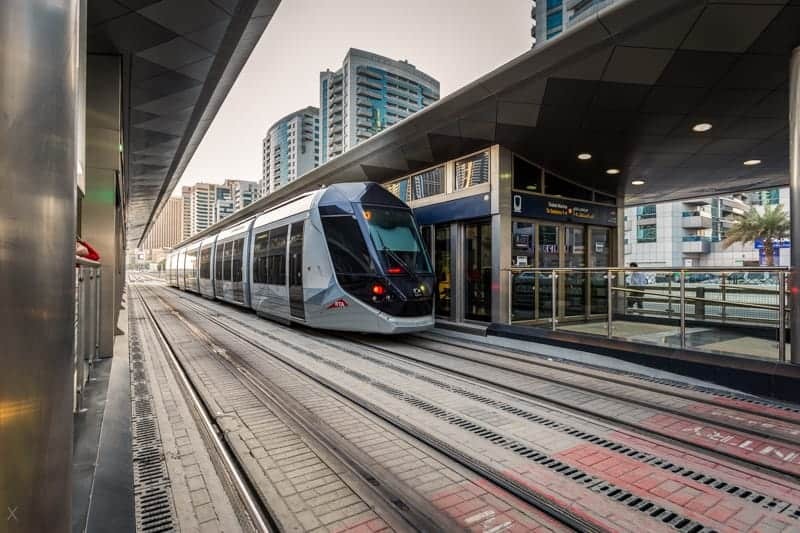 The station is convenient for those visiting the northern end of Dubai Marina or Jumeirah Lakes Towers. Hotels in the area include Grosvenor House and the Dusit Residence Dubai Marina. Dubai Marina Mall (0.5 miles) - Shopping mall at Dubai Marina. Indego by Vineet (0.4 miles) - High-end Indian restaurant at Grosvenor House. Led by Vineet Bhatia, a Michelin-starred celebrity chef. Impeccable service. Sloane's (0.4 miles) - Buffet restaurant at Grosvenor House. Huge choice of dishes. Best known for its Friday brunch. Buddha Bar (0.4 miles) - Large restaurant and bar at Grosvenor House, Dubai Marina. Opulent two-floor layout. Floor-to-ceiling windows offer fantastic view of the Dubai Marina. DJs and party nights. Toro Toro (0.4 miles) - Latin American restaurant and lounge at Grosvenor House, Dubai Marina. Two-floor venue with upstairs bar. Friday brunch and ladies’ nights. Zengo (0.5 miles) - Pan-Asian restaurant and lounge bar at Le Royal Meridien Beach Resort & Spa. Stylish interior. Indoor and outdoor seating. DJs, ladies nights, and lively bar. Map showing location of Dubai Marina Tram Station.